Well, here we are facing the last Blu-ray Disc releases of 2010. And, while streaming technology seems to be stunting BD’s long term growth, The Wall Street Journal (via Nash Information Services) reports holiday sales of Blu-ray Discs were up 75% this year compared to last year’s holiday season. You may have noticed “gift wrapped” Blu-ray Discs going for $10, $15 and $20 at retailers such as Walmart — making great stocking stuffers for the 13% to 20% of US consumers who will own a BD player going into 2011. One of this week’s more popular titles now on Blu-ray Disc is Resident Evil: Afterlife which is available in both 2D and 3D versions. The film stars Milla Jovovich, Wentworth Miller, and Ali Larter. Blu-ray formats include 1080p video at 2.39:1 aspect ratio with DTS-HD Master Audio 5.1. Extras include filmmaker commentary, featurettes and production documentaries, deleted and extended scenes, outtakes, “Undead Vision: Picture-in-Picture” and BD-Live. 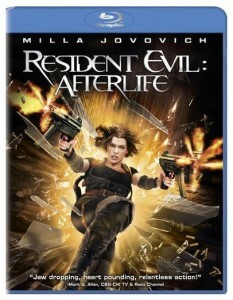 The 2D and 3D versions of Resident Evil: Afterlife retail for $34.95 and $39.95 respectively. Another film worth noting this week is Derailed starring Clive Owen, Jennifer Aniston, Vincent Cassel. The 2005 drama/thriller from Weinstein Co. is apropos of 1987’s Fatal Attraction beginning with one man’s infidelity and evolving into a twisted plot. The BD is formatted in 1080p with a widescreen aspect ratio of 2.35:1. The Blu-ray Disc version of Derailed (it was previously released on HD DVD) retails for $19.97. Get pricing on all this week’s Blu-ray Disc releases for Dec. 28, 2010 from Amazon.com.